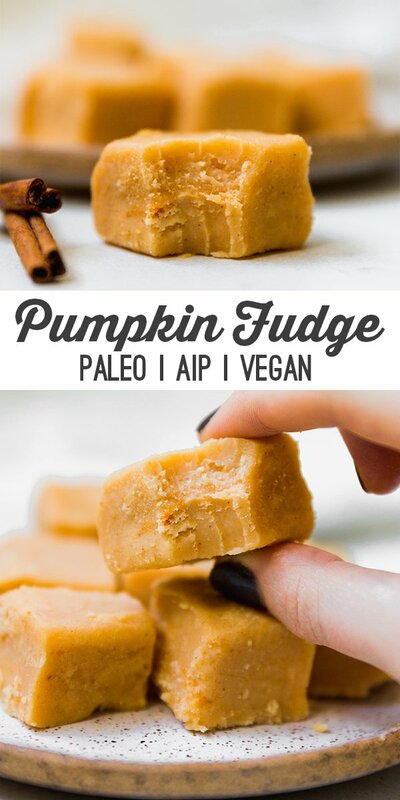 This paleo pumpkin fudge is an easy and delicious treat! It’s paleo, AIP, and vegan-friendly. Who doesn’t love easy snacks and desserts, right? I used to love being able to just jump in my car and drive down to the local grocery store to get a cookie from the bakery when I wanted a treat. Once I went gluten free, it suddenly became a lot harder to track down the gluten-free convenience snacks, and then even harder still when I went paleo and AIP. 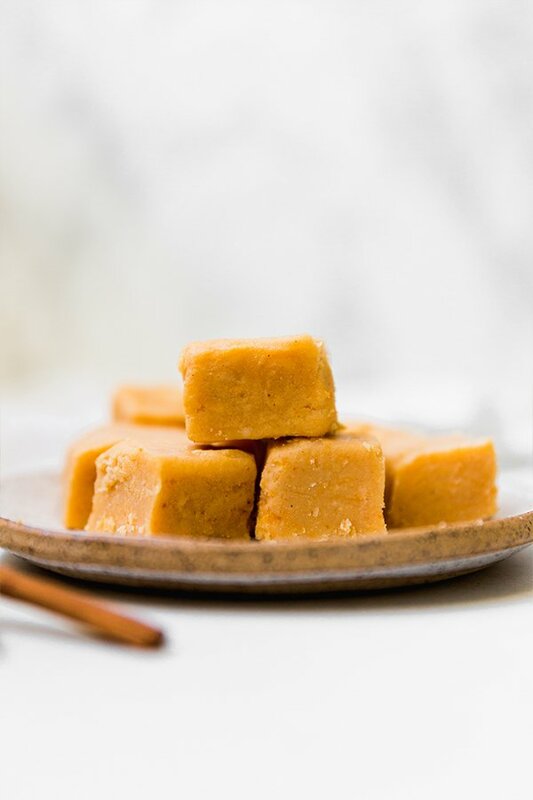 This paleo pumpkin fudge totally fills that void of an easy, no-bake convenience treat! You don’t have to bake a complete pumpkin pie with a homemade crust and the entire works to enjoy pumpkin season! 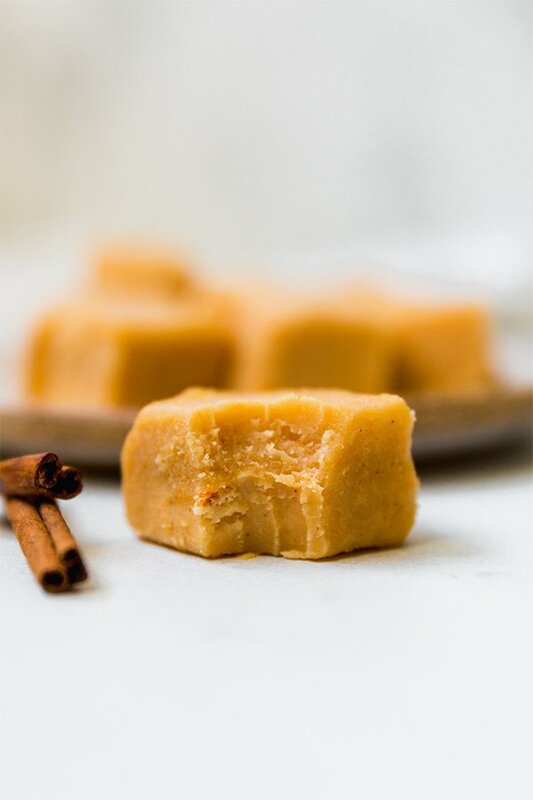 You can get all of the flavors of fall with a snack like this pumpkin fudge! Not only is it a great treat to stash in your fridge for whenever you have a sweet tooth, but it’s a perfect option for a healthier Halloween treat. This is different from coconut oil, and cannot be swapped with coconut oil. 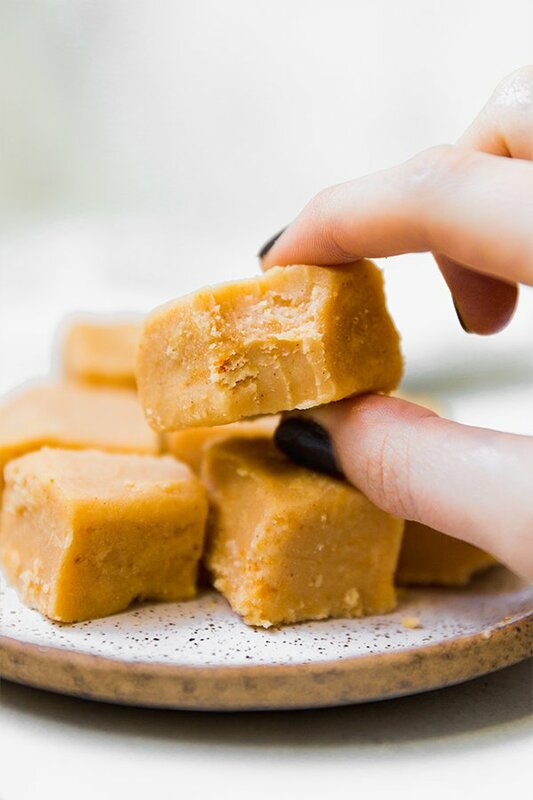 Coconut butter is made from the meat of the coconut and makes for a really great base for this fudge! This adds more healthy fat as well as helps with the texture of the fudge. Gotta have the pumpkin, right? The maple syrup flavor pairs great with the pumpkin and cinnamon, but you could technically use honey as well. Assemble a double boiler with a medium sized pot filled halfway with water. Bring the water to a simmer and place a metal mixing bowl over the pot. Pour the coconut butter and coconut oil into the metal bowl and allow it to slowly melt, mixing often. Once the mixture is melted and completely liquid, stir in the pumpkin, maple syrup, and cinnamon. Mix together. Use an oven mitt to carefully remove the bowl from the heat and set aside. Prepare a small Tupperware or baking pan (I used a small 5×5″) and carefully line with parchment paper. You can also use silicone molds. Pour the fudge mixture and spread it evenly with a rubber spatula into the vessel. Place the fudge in the fridge to harden for 3-4 hours or overnight. Remove from the fridge and slice into the desired size. If you have any imperfect pieces, allow the fudge to sit out for a bit and use your fingers to mold them back into a prettier slice! Can’t wait to try these…very Yummy looking!! Thanks so much, Ree! I hope you like it! This recipe sounds great! But I don’t have coconut butter; can I put something else? Even if it’s not very “AIP”? I would really love to try this one! Thank you! Thanks, Alexandra! I’m not sure if there’s a sub that would harden quite the same way. I’m not sure if there’s a good substitute that would harden the same way that coconut does for this particular recipe. How long are you supposed to keep the ingredients on the heat? My mixture looked perfect and as I was mixing in the last ingredient (the cinnamon) it all started to separate. Smelled delicious but almost looked like it was curdling. Should I have removed it from the heat immediately after adding the maple syrup? I would pull it off once it’s melted. It’s hard because all coconut butters are different! It can be a finicky ingredient. Artisana is my favorite. Mine separated too. I’m thinking I’ll let cool a bit, then mix once it’s set a bit before placing in fridge. Or maybe even add cold pumpkin after taking off the heat.